A long-time fan of science fiction and fantasy, Tom has spectacularly failed to grow out of his obsession with things that don’t, in the strictest sense of the word, exist. He has a Masters in Fine Arts from Sussex University and also a Masters in Philosophy and Economics from Edinburgh University. Find Tom on Twitter @tomhpollock and at skyscraperthrone.com and http://tompollock.com/. 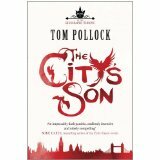 The City’s Son: Hidden under the surface of everyday London is a city of monsters and miracles, where wild train spirits stampede over the tracks and glass-skinned dancers with glowing veins light the streets. When a devastating betrayal drives her from her home, graffiti artist Beth Bradley stumbles into the secret city, where she finds Filius Viae, London’s ragged crown prince, just when he needs someone most. An ancient enemy has returned to the darkness under St Paul’s Cathedral, bent on reigniting a centuries-old war, and Beth and Fil find themselves in a desperate race through a bizarre urban wonderland, searching for a way to save the city they both love. 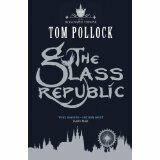 The Glass Republic: Pen’s life is all about secrets: the secret of the city’s spirits, deities and monsters her best friend Beth discovered, living just beyond the notice of modern Londoners; the secret of how she got the intricate scars that disfigure her so cruelly – and the most closely guarded secret of all: Parva, her mirror-sister, forged from her reflections in a school bathroom mirror. Pen’s reflected twin is the only girl who really understands her. Then Parva is abducted and Pen makes a terrible bargain for the means to track her down. In London-Under-Glass, looks are currency, and Pen’s scars make her a rare and valuable commodity. But some in the reflected city will do anything to keep Pen from the secret of what happened to the sister who shared her face. 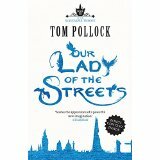 Our Lady of the Streets: Ever since Beth Bradley found her way into a hidden London, the presence of its ruthless goddess, Mater Viae, has lurked in the background. Now Mater Viae has returned with deadly consequences. Streets are racked by convulsions as muscles of wire and pipe go into spasm, bunching the city into a crippled new geography; pavements flare to thousand-degree fevers, incinerating pedestrians; and towers fall, their foundations decayed. As the city sickens, so does Beth – her essence now part of this secret London. But when it is revealed that Mater Viae’s plans for dominion stretch far beyond the borders of the city, Beth must make a choice: flee, or sacrifice her city in order to save it.